I have this recurring numbness in my right arm. Before, I used to think that it was only because of my bout with carpal tunnel syndrome which I wrote about back in June. The shooting pain has long gone because I bought and wore a wrist brace for some time but the numbness remained. 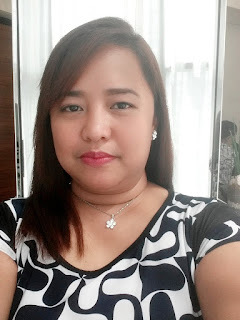 It was one of the reasons why my husband and I took a trip to Banahaw Heals Spa Cainta which was near our place plus the fact that we both needed a massage. My husband's back after our massage and ventosa cupping session. The first time I heard about Banahaw Heals Spa's ventosa cupping service was from my cousins-in-law in Biñan. Since they're both fair-skinned, I immediately noticed the black and blue cup marks on their backs after their trip to the spa. Cathy, my husband's first cousin, told me that the darker circles are the muscles that are most stressed. I'm glad that our massage therapists suggested that we avail of the ventosa cupping service since we only had to add Php 150 each on top of our Php 275/hr massage service. Since our beds were just beside each other, I was able to watch the therapist placing drinking glasses on my husband's back. I also saw how his skin was slowly sucked in my the pressure brought by the flame in the glass. The glasses were left on our backs for 15 minutes. After that, our therapists proceeded with the massage. I really enjoyed the massage that we had at Banahaw Heals Spa Cainta. We usually have our massages done at Nuat Thai in Taytay because of the Afternoon Delight promo (which was priced at Php 250/hr from 1-6pm) and because my husband is not very fond of massage oils. I, on the other hand, want to have a Swedish massage every now and then. Banahaw Heals Spa have a signature combination massage that included both the stretching techniques of Thai massage and the relaxing strokes of Swedish massage. The oil they used wasn't greasy either which was a 2 thumbs up for the husband's taste. We immediately signed up for a lifetime family membership card (which cost Php 500) and promised our boy that he'll also have a massage session the next time we go back. Yes, they also offer massage sessions for kids. In fact, they have a student rate of Php 100/hr for a massage. Banahaw Heals Spa Cainta is just one of the many branches of Banahaw Heals Spa. The good thing is, the membership card is accepted in all their branches. For more information about Banahaw Heals Spa's services, you can visit the Banahaw Heals Spa Cainta's site or LIKE their Facebook page.